Terrible prophecy has began to come true. The evil shaman leads troll army into our lands. You have to find a way to summon powerful elementals to stand against the trolls! 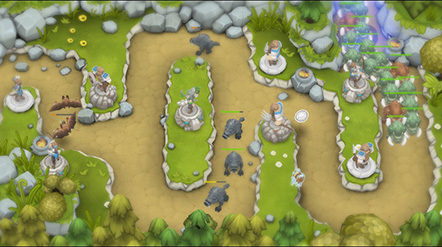 Warstone is tower defense strategy game with a high number of new features, fancy graphics and a really cool story! No towers! Choose from 28 units to defend! Great choice of spells: Firewall, Lightning, Meteor, Elemental summon, Poison cloud, Astral warriors, Transmutation etc. Different game modes: Classic TD, Maze, Hero defense, Attack and Defense -PvP-, Cooperative missons, Custom maps, etc. Each basic unit have 3 options for further upgrade. Big skill tree for every unit. The main feature of the game is absence of towers! Instead, there are warstones. You can put them anywhere you want and summon unit upon them. There are 7 basic units: peasant, archer, gunman, healer, eagle, wolf, elemental. 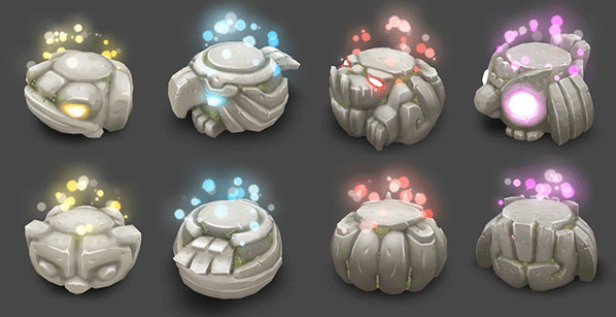 Each basic unit can be upgraded into another 7 units. For example, peasant becomes mercenary, who can be upgraded into knight, fearless warrior with high damage and slow attack, or witcher, demon hunter with rapid sword attacks, or into monk, armless figher with strong abilities. Each tower has unique damage type, gold cost, special abiblities. So the main feature of the game is pure strategy. You must think hard to find the best solution for every level. In addition, you can choose 1 of 3 game classes. Commander has skills which improve the power of units and have unique abilities. He can transform usual warstones into powerstone which gives extra bonuses. He can destroy the stone for dealing a lot of damage to nearby units. The weapon of the treasurer is gold! He does everthing to get more gold: bounty is increased, units are cheaper, drop coins give more gold, unique gold spells like transmutation into golden statue. All these will make army of treasurer three time bigger than otherse. Also he can carry twice more items and artifacts. The power of sorceress is spells. He can have three times more spells at once than other classes. He regenerate manafaster then spend it. He knows powerful spells like Elemental summon or Meteors rain. He can transfrom units into mana. He can pass level using only spells.